I created this platform for the speaker of Trinidad English Creole (TrinEC). My overall desire is for nationals to connect with the country on a deeper level. All nationals regardless of background speak this dialect. It is part of our culture and something that unites us. Understanding that unity, I hope, will foster national pride and love of each other, thereby diminishing societal issues. I created this project because I wanted to learn about the history of the dialect of Trinidad and Tobago–especially the dialect of my island, Trinidad. While nationals are well versed in the language, most of us don’t know the etymology of the words that we choose to speak. English is the official language of the country and is spoken in formal settings. TrinEC or Trini is the preferred variety for informal and private communication. English, because of its strong association with educational systems and the official institutions of government and society, generally has higher prestige than TrinEC but the latter enjoys increasing status as a sense of nationalism increases. This project included a vast amount of research into the language and the history. My language research revealed that there are two separate dialects spoken in the country, Trinidad English Creole and Tobago English Creole. I focused on researching TrinEC. Trini sounds like English. However, the vocabulary words, phrases, and mannerisms are not of British descent. They come from our ancestors: the natives, the slaves, their masters and the indentured workers. It is an oral language that’s a mix of vocabulary from French, Spanish, Portuguese, African and Indian languages, to name a few. Trini Talk goes beyond articulating the popular words and phrases that are distinct to our language but dives deeper to revive the history behind each word. It is about embracing the parts of me that I do not know – starting with the language. To know where I am going, I need to know where I came from. Being a visual person, I chose to showcase this spoken dictionary in an interactive and visual way. I found the Dictionary of the English/Creole of Trinidad and Tobago written by Dr. Lise Winer. It is a research dictionary of TrinEC and TobEC etymology. This book was helpful as it allowed me to gain a clearer perspective of the contributions each settler made to TrinEC. However, the dictionary is limited. It is not a living document as a website is. It cannot be added to. It is not accessible as it is a research dictionary made for linguists. The pronunciations of words are not comprehensible by regular users. It is very expensive at $95 US dollars ($642 TTD). 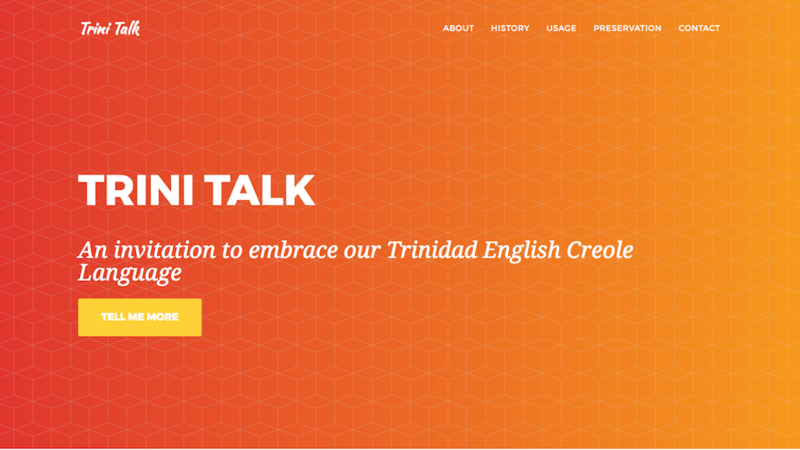 Trini Talk is a web platform designed to communicate the etymology of the Trinidad English Creole Language. There is no online presence for the etymology of TrinEC. Trini Talk creates one. Users are prompted to participate in the preservation of the language then get to explore the vocabulary and by extension the history of Trinidad. The platform uses a sample dataset from the Winer dictionary to teach this oral language through an interactive visualization. The visualization incorporates Trinidad’s history to show when these words were added to our dialect. By interacting with the timeline, respective words from each group are displayed and history shown. The user has the option of singling out words or phrases they wish to explore from the visualization. Engaging a word or phrase produces a sound sample of the pronunciation, text with the meaning, and historical reference. The Trini Talk web platform uses p5.js, JSON data, and d3.js to create this visualization. Video is also included. It shows conversations with locals speaking the language in real-life situations. Key phrases and words are highlighted so the user can explore them further. I shot video and used Adobe Premiere to add desired reference content. In Orality and Literacy, Ong explains “Words acquire their meanings (from) … gestures, vocal inflections, facial expression, and the entire human, existential setting in which the real, spoken word always occurs.” This is true of TrinEC. Our gestures and facial expressions articulate more precise meaning. The language is evolving as new vocabulary is being invented, so Trini Talk includes a platform to gather these new additions to the dialect from nationals. This is a preliminary effort to digitally preserve both the old language and to incorporate the new. Oral languages evolve. To capture new TrinEC words, sayings and abbreviations I created an API for each category on Google’s Firebase platform. Users are prompted to add content to each database. Each entry is automatically added to the respective API. Abbreviations used by locals for messaging on social media platforms are collected. Sharing this API dataset can encourage the use of local abbreviations and can keep the language relevant among the youth. Phase two of Trini Talk is a larger research project. Expanding research to include TobEC is crucial. A full API of TrinEC and TobEC will be created. Showing the relationships of the language to the larger Caribbean diaspora is also necessary. The Caribbean needs repositories to archive and share its language information. Trini Talk was created with this sort of preservation in mind. A google-translate type platform of the language is also desired. With this platform text-to-speech type installations can be created, as currently no computer understands our way of speaking. Generally, the Caribbean lacks resources to create platforms like this to more broadly showcase and essentially preserve our culture. There is no lack of creative vision in my nation, but I don’t see resources like Trini Talk on the market. I want to use what I have learned at ITP to create works for the Caribbean market – back home. I cannot ignore that most of what I was taught at ITP is not even on the radar of folks at home. I have to “come good” to even present something like this to a Trinidadian. The language is evolving as Trinidad and Tobago is exposed to international influences. If we do not want to lose our culture, we have to start preserving and reaffirming its use now. The death of a language also means the disappearance of cultural creativity, the loss of traditions that often date back centuries. Language and culture are inseparable. A language represents how a particular culture and people interact with the world around them and with each other. If you lose a language, then you lose a huge chunk of that culture . TrinEC has already suffered losses. We need to ensure we stop the culture of TrinEC from dying. A 2003 UNESCO document states: “ … Each language embodies unique cultural and ecological knowledge in it. It is also because languages are diverse. Documentation of such a language is important for several reasons: 1) it enriches the human intellectual property, 2) it presents a cultural perspective that may be new to our current knowledge, and 3) the process of documentation often helps the language resource person to re-activate the linguistic and cultural knowledge.” I am not suggesting that TrinEC is dying but it is certainly changing at a rate that according to my research is not favorable to older nationals. They want “the old time ways” of speaking and doing things to be reintroduced.